Situated in the Prairies & Lakes region south of Fort Worth, the area around densely wooded Cleburne State Park attracted a number of Native American groups for centuries before the region was permanently settled by European and Anglo Americans soon after the American Civil War. 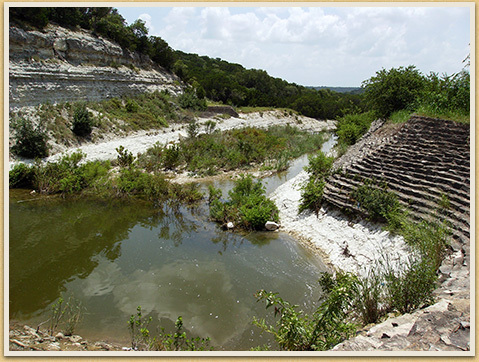 Juniper, oak, elm, walnut, mesquite, redbud, cottonwood, sycamore, ash, and sumac trees cover the area's white rocky hills, but it is the beautiful valley of natural springs that eventually stamped Cleburne as a picturesque setting for a park. Like many parks constructed by the CCC, Cleburne State Park centers on a man-made water feature—a large lake. Constructed with difficulty and plenty of trial and error, the small earthen dam and impressive three-level masonry spillway were finally brought to completion. The undertaking, which fell under the auspices of the National Park Service, consumed an inordinate amount of time and labor, which likely explains the company’s failure to make substantial progress on other planned structures. However, the enrollees were able to complete another major project, the three-mile long scenic park road. In 1940 Company 3804 was disbanded. A bath house, designed by George T. Patrick, Paul E. Pressler, and R. J. Hammond, did win approval for construction, but only at the end of the CCC era. A cooperative effort between several original designers, now working for the State Parks Board, and the WPA made sure that the building was completed in 1944. Since the 1940s several buildings have fallen into disrepair, notably the bath house. They are being replaced. Portals, Entry Bridge, Park Road 21, Earthen Dam and Rock Spillway, Caretaker’s Dwelling, Garage and Truck Shed, Water Tower/Pump House, Culverts, and Table and Bench Combinations. The Boat House and Boat Dock were designed, but not built. Bath House and Piping (water and sewer system) were completed subsequently by Works Progress Administration laborers.